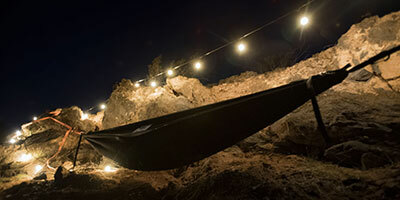 Now you can rent the newly released hammock hot tub, or the Hydro Hammock to be specific. Hammocks are amazing, and hot tubs are so relaxing, combined they’re magical! The hammock hot tub holds up to 50 gallons of water and 2 adults, that you can use anywhere. It comes with a portable suitcase sized compartment that holds a propane heater, a pump, a battery, and the two hoses to circulate the water. It truly is luxurious sitting in hot water filled hammock. With the on-demand propane heater this means it can get as hot as you want it too. Multiple Easy Locations Are Available – Call Us For Details! You can either take it near water and pump it into the hot tub, or we can haul the water to it (we just use a 55 gallon barrel). That way you can sit in a hot tub at places you never have been able to before! Think of how many camping trips you wished you had a hot tub to sit in? Think of watching the sun go down in a hammock, in a hot tub…yes it is that wonderful. Just show up and your hammock hot tub will be waiting for you already heated and ready! Take down is easy, but if you don’t want to be bothered with it then just have us take care of its.